Whether your little girl hopes to ring in Halloween parading around the Colosseum as an admired empress or she hopes to trick-or-treat atop Mt. Olympus as a Greek Goddess, she can feel like the crème de la crème of the ancient world with nothing more than a quick and simple costume change. How magical! 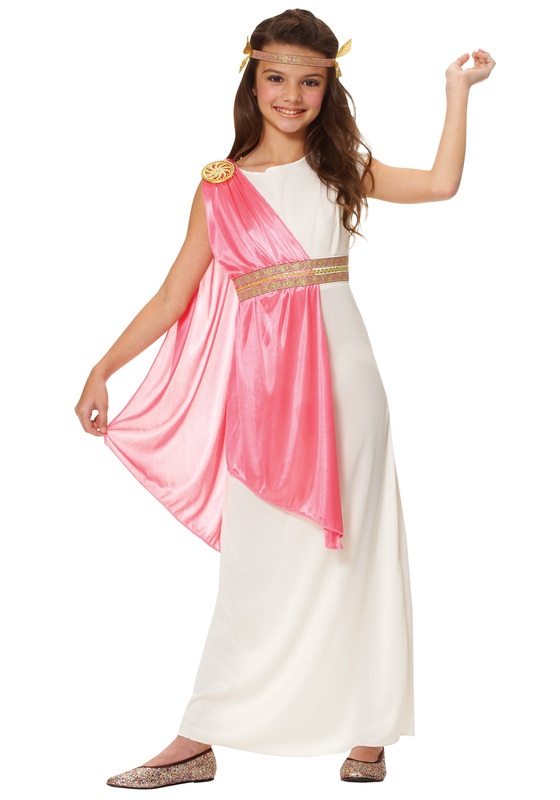 This elegant and ethereal Ancient Roman Empress Costume is an ideal look for your resident young historian and lover of all of life’s finer things. She already spends hours a day pouring over accounts of ancient events, watching documentaries from bygone eras, brushing up on her Greek mythology, and then quizzing you on it (Do you know the Greek god of blacksmiths, sculptors, fire, and volcanoes? We didn’t think so…) But you also may not know that the female figures of ancient times were not “all beauty and no brains”--nope. These wives of emperors, women of status, and of course, the goddesses, were all powerful people in their own right--just like your little girl! So it's high time to crown her the goddess of Halloween and empress of your living room, letting her live out her destiny in this pretty costume. The pink and gold accents of this dress and headband will tickle her fancy and have her feeling like Greek divinity faster than she can say "Aphrodite." This costume is perfect for Halloween and imaginative play--and she may even look forward to going to the Roman baths to scrub up at the end of the night!